understandings of teachers' OCB, its nature, components, and salience in schoolspersonal, organizational, and cultural factors which might facilitate or inhibit teachers' OCBcontributions and the drawbacks of OCB for the improvement of educational systems, schools, and educatorsa new conceptualization of teachers' OCB based on the unique characteristics of school and the teaching profession, and consequences for theory and practicepractical tools for guiding educational policy-makers, principals, and teacher educators on how to assimilate and enhance teachers' OCB. 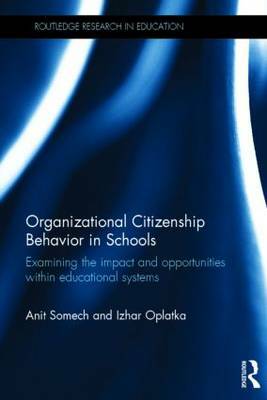 Organizational Citizenship Behavior in Schools will appeal to scholars and researchers in educational administration, educational policy, school leadership and teacher education. It will also be of interest to supervisors, policy makers and postgraduate students in the field of education.